Evan and I recently went to a “Sauce Soiree” where everyone came bearing a homemade sauce and competed for prizes. A lot of people brought barbecue-type sauces, since it was sort of a barbecue, but I made a peanut sauce that a make pretty frequently. 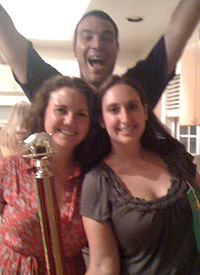 After much deliberation on the 12 or so sauces, mine won in the Most Creative Sauce category — and got a giant trophy! With a pig on top! Since this sauce is one I make frequently, I don’t tend to use any exact recipe, I just scoop and pour and adjust things to taste. I’ve tried to approximate the amounts of each ingredient below so if you’d like to try this you can at least get started and then play around until it tastes good. Heat peanut butter, vinegar, soy sauce, sesame oil and water in a small saucepan. Add the lime, herbs, and chili sauce or Sriracha toward the end, and add additional water to get the sauce to the desired thickness/thinness. I typically eat this sauce on a tofu and veggie stir fry over rice. Monday night I decided to make a loaf of no-knead bread. I’ve made this simple and delicious bread many times and for some reason it always turns out differently — I don’t know if I’m just not consistent with how I’m making it, or switching up the flours as I sometimes do has more of an effect than I thought it would, but this bread looks and cooks differently each time, though it always ends up tasting good. Well, Monday I really messed up. I was mixing the dough together from memory and doing it quickly, and I forgot — wait for it — the yeast. This bread only has four ingredients — flour, water, salt and yeast — and I managed to forget one! Worst of all, I didn’t even realize until the morning, so after sitting out all night on my counter, my dough was just a gluey, saggy and wet lump. I wondered if I could just add some yeast in after the fact and tried to mix in the quarter-teaspoon the recipe calls for. After letting it sit awhile, it seemed that the yeast had just settled into one area of the dough and was just creating bubbles in a small area, not throughout. Still, the dough had an interesting consistency, and I thought that it could possibly be saved, so I decided to look up recipes that use a preferment mixed in with more flour, yeast and water to create a richly flavored bread, and I came upon a rustic bread recipe that used similar proportions of ingredients for its preferment. So with my unintentional preferment of 2 cups bread flour, 1 cup wheat flour, 1 teaspoon of salt, 1 tablespoon of flaxseed meal, 1 5/8 cups water and 1/8 teaspoon of yeast added after the fact, I added 2 cups bread flour, 2 cups wheat flour, 1/2 teaspoon of yeast, 1/2 teaspoon of salt, and 1 1/2 cups water and mixed it all together. I ended up with a huge amount of dough, and I had trouble working with it on my small counter, but after a good amount of kneading and some extra flour (the preferment was much wetter than it should have been), I had a nicely textured and very elastic dough. I let it rise for about two and a half hours, folding it twice during that time, then split it in half and formed two loaves, which I let rise for another hour and a bit. I was encouraged by how much the bread was rising and I felt like it would turn out pretty well once I baked it. When I put it in the oven at 450 degrees on a baking sheet dusted with cornmeal, I didn’t expect the loaves to continue to grow quite as much as they did. 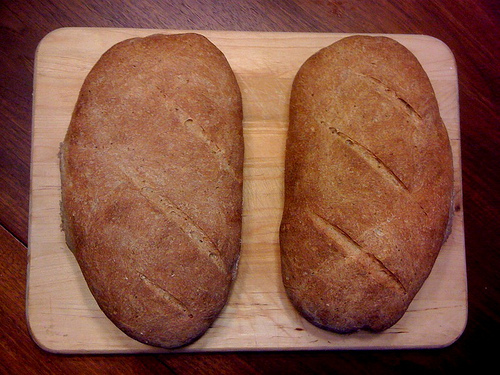 I ended up with two giant loaves that fused together a bit. I took them out after 35 minutes, when they looked nicely browned and the crust had a nice thump to it. 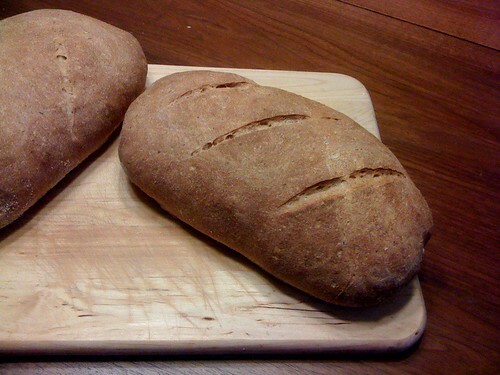 The bread softened a bit when it started to cool, so maybe I should have cooked it another few minutes, but the loaves looked great and when we cut into them they had a decent texture — a few large air bubbles, a thin and crispy crust, and a pretty robust wheaty flavor. I’m glad what looked like a bread disaster turned out to be a big bread success. 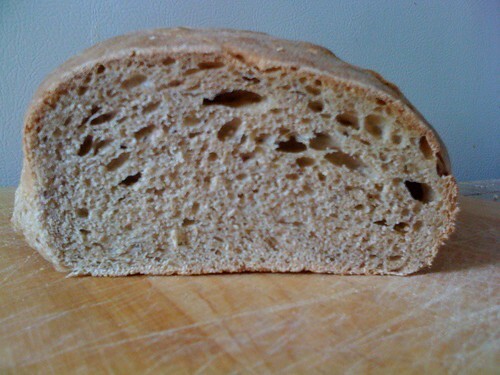 It was one of my prettiest and most delicious simple loaves. I’ll definitely be trying something similar again. And with a proper preferment, I’m sure I’ll get much better air bubbles throughout the loaves. Friday night I decided to try something new. I didn’t really know what at first, but as I was flipping through my Vegetarian cookbook, I came across a recipe for a mushroom and cauliflower gougère. I didn’t have any mushrooms, but I did have some asparagus, so I decided to try my own version of the recipe. The recipe came together quite quickly. 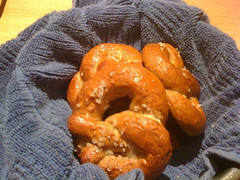 I made the dough, which includes a generous amount of butter and cheese, and spread it around the sides of a cake pan. 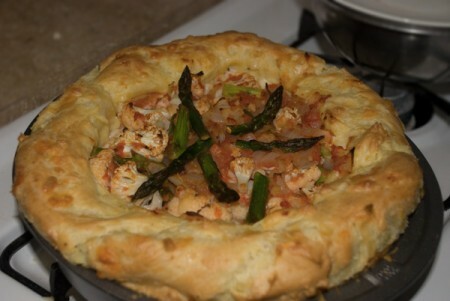 Then I quickly cooked up some onions, cauliflower and asparagus with some pureed tomatoes, thyme and rosemary, and put the mixture in the center of the dough. It went in the over for about 40 minutes, and it puffed up like crazy. The dough doubled in size, but by the time it reached the table just a few minutes later it had lost some of its airiness. The gougère was quite decadent. 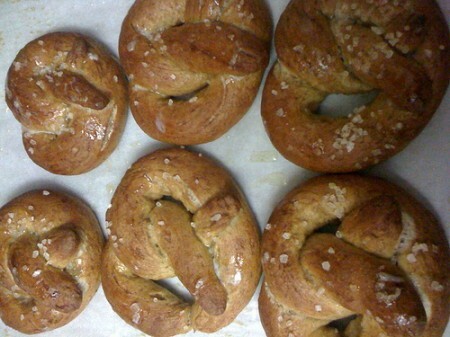 The dough was creamy yet fluffy, and the vegetable filling balanced out the richness of the dough. 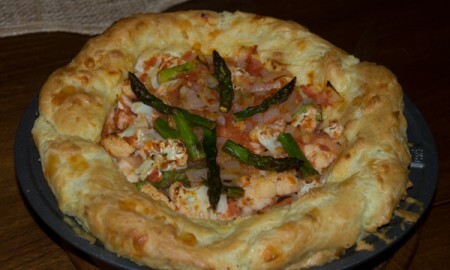 I also thought it looked quite beautiful — and the asparagus made for a nice colorful addition. I thought it turned out even prettier than the photo in my cookbook since it was more colorful. I was also surprised that this was relatively easy to make. 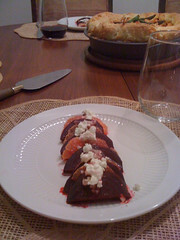 Including the beet, grapefruit and goat cheese salad I made, everything took about an hour and a half. Since I started getting my LOVE Delivery veggie boxes, I’ve been getting a lot of beets, and I find that I absolutely love cooking with them. I was a little intimidated when I first was faced with cooking beets since I’d never cooked one before, but just simply roasting them and then peeling them is about all you need to do. This salad was particularly tasty and it looked very pretty, though the warm beets did start running a bit in the dressing when I moved the plates. You’ll need about half a beet and half a small grapefruit per person. Unwrap the foil and allow the beets to cool until you’re able to peel off the skin with a paring knife. Cut the beets in half and then create quarter-inch thick slices. Peel your grapefruit and cut it in half. Slice those halves into quarter-inch thick slices, removing any seeds. For the vinaigrette, finely chop the shallot and place it in a small bowl. Pour in red wine vinegar until the shallots are just about covered, and let them sit for at least 10 minutes. Add olive oil, lemon juice, salt and pepper to taste. Alternate the beet and grapefruit slices in a line on your salad plates. Spoon a small amount of the vinaigrette over the salad and top with some crumbled goat cheese. A few weeks ago, we invited friends over for dinner on very short notice. I had enough food in my fridge and pantry — I just needed to figure out what to make. I put together a salad with grapefruit, avocado and a shallot-citrus vinaigrette, and I pulled some little puff pastries out of the freezer, baked them, and filled them with a mixture of cauliflower, goat cheese and other vegetables. I was worried that dessert would be a problem. I only had one egg in my fridge. So I started looking for something relatively simple that would work with the ingredients I had on hand. I found a recipe for Butter Drop Cookies in my trusty How to Cook everything and saw that there was a modification to make them into Chocolate Drop Cookies. That sounded perfect. They were quick to make — about 30 minutes from gathering the ingredients to pulling them out of the oven, and they turned out to be fluffy, cakey, soft cookies that weren’t too sweet or rich. I was missing a few ingredients, including milk, which I substituted with water, and vanilla, which I just did without. I also didn’t have enough plain sugar so I used some light brown sugar — and the cookies still turned out just fine. 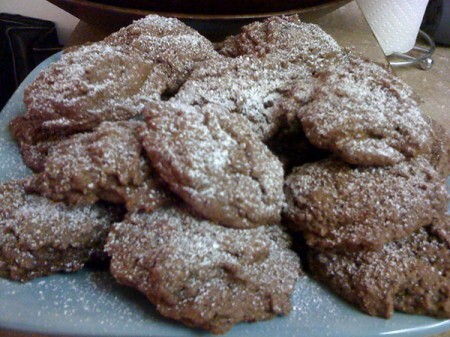 And though the recipe didn’t call for it, I dusted them with powdered sugar to make them look a bit more festive. The cookies kept well for quite a few days, and I even made them again a couple of weeks later — and I had all the right ingredients — when Evan’s brother was in town and wanted something sweet after dinner. They were even better when I was able to include vanilla and milk. With a mixer, combine the butter and sugar, then add in the vanilla and egg. 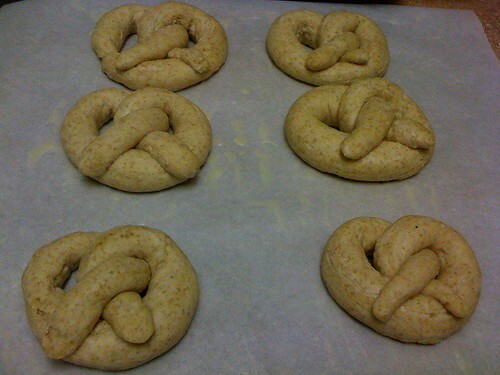 Mix together the flour, salt and baking powder, and add the dry ingredients and the milk a bit at a time. Once all the ingredients are incorporated, add the melted chocolate. Spoon the soft dough into mounds on a baking sheet, and bake for about 10 minutes, until the cookies seem to be firming up a little, but still soft. Let the cookies cool a few minutes before removing from the pan, and dust with powdered sugar before serving. It’s Hanukkah! And that means it’s latke time. 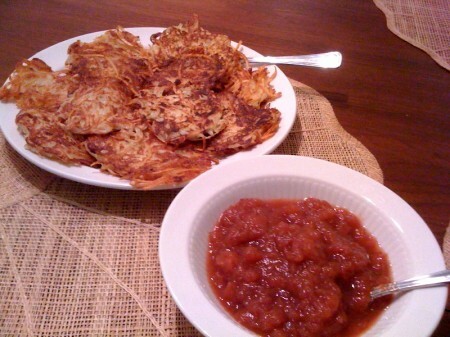 Those tasty, greasy potato pancakes come in a variety of styles. My personal preference is to keep them thin and somewhat crispy. That’s why I like recipes that leave the potatoes simply grated and don’t have much or any flour. The recipe I’ve been using for a few years, always turns out well. I believe it’s from my parents’ food processor cookbook. Peel and grate the potatoes (I recommend doing it in a food processor), then wash them under cold water and squeeze out the excess moisture. Grate the onion and mix all the potatoes, onion, eggs, salt and pepper together in a bowl. Get the oil nice and hot, and start frying away until each side is nice and browned. Drain on paper towels and serve hot with applesauce or sour cream. Now, for that applesauce. If you’ve never made it, it’s remarkably easy and will taste much better than any you buy at the store. And, there’s only really one ingredient — apples. I sometimes use apple juice, too, since it’ll make it a little sweeter. All you need to do is peel and cut up the apples — I used 2 large ones and a cup of strawberries for the applesauce you see in the photo above — then put them in a pot with apple juice or water (or some combination of the two). Cook the apples over medium heat stirring frequently until they begin to fall apart. After about an hour, you’ll have applesauce. If you don’t like it a little chunky, you can puree it with a food mill or food processor. You can also add some sugar if it’s not sweet enough, but this shouldn’t be necessary if you’ve used apple juice in place of some of the water. I really liked the strawberry applesauce I made — it was quite sweet and chunky, and it had a beautiful reddish color. I’ve also made it with plums before, which also add a pink color. 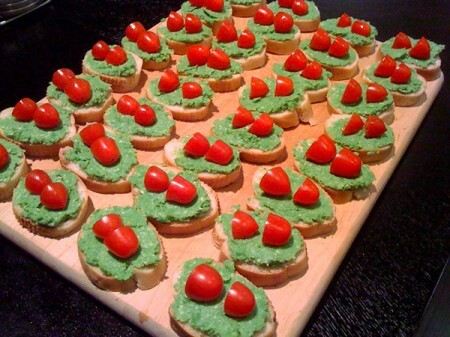 A few weeks ago, I was watching Giada at Home on the Food Network and Giada made a super simple and pretty looking recipe — Pea Pesto Crostini. I decided to make it when we had a friend over for drinks and it was a hit, and then I made it again this past weekend for a holiday potluck. With only 4 ingredients in the pesto — defrosted peas, garlic, parmesan cheese and olive oil — plus some bread and tomatoes, it’s quick to make, and it packs a surprising amount of flavor in every bite. It also has a great festive red and green palate and looks really pretty sitting out on a plate or board. Check out the original recipe. I’ve already used it twice and will likely use it again.